Three former students of Reepham High School and College are heading to Madison Square Garden in New York in August to play for England Lions in the Dodgeball World Cup. The top players from 10 countries across five continents have qualified and will meet in the second ever World Cup competition. 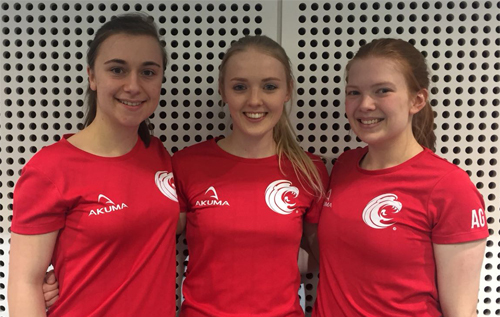 Lauren Hems and Holly Edmonds, both from Briston, participated in the first Dodgeball World Cup in Manchester in 2016, while Abbie Gower from Reepham at that time was concentrating on playing football for Norwich City Ladies. All three friends, now 20, were selected to play football for the Norwich City Girls’ Centre of Excellence while still at school. They started playing dodgeball at RHSC with the Reepham Raidettes and continued while at university, now playing league dodgeball for their respective teams. Before heading off to the USA they will compete in the Northern European Dodgeball Championships in Middlesbrough in May.